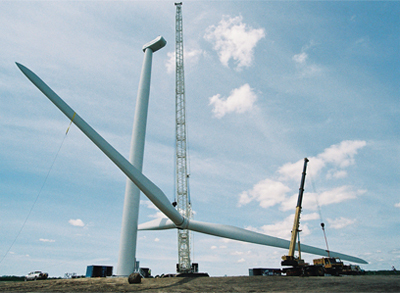 Erection of wind farms and systems for handling ever larger components has progressed since the early commercial projects of the 1980s. For a period up to the mid 1990s, the allowable mass of components to be lifted to hub height was determined by available cranes. Subsequently, there has been a shift, indicative of the maturity and growth of the wind industry, where crane manufacturers are producing designs specially suited to wind farm installation. Often complete rotors are lifted on to nacelles. Sometimes hub and blades are lifted individually. The Enercon E126 exploits a jointed blade design to facilitate transport, handling and erection of the rotor components. The blade joints are made up in the air. Thus, rotor erection practice moved through size ranges where complete rotors were crane lifted, to size ranges where hub and blades were lifted individually, and now to the E126, where blade parts are lifted individually. A wind farm of Nordex N100 wind turbines (the largest Nordex wind generators in the US) was erected (Figure 3.28) over a five mile long ridge south of Wadena, Minnesota. This project made first use of the new 2007 DEMAG CC2500-1, a 550 ton crawler, a crane with 126m of main boom with jib combination to 168m. Transport of the CC2250-1 with maximum boom and counterweights requires 36 truckloads. This assembly approach for a wind farm involving whole rotor lifts of 100m diameter rotors contrasts strongly with the erection strategy of the E126.